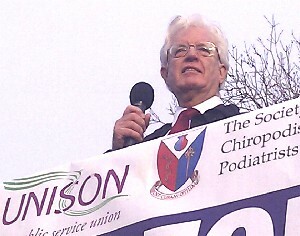 Upwards of 10,000 public service workers were treated to a barnstorming performance by Rodney Bickerstaffe today outside the Scottish Parliament. Reaching out to the young people on the rally, he was cheered as he urged them, “You wonderful young people, you have a legal right and a moral duty to stand up to bullies and diktat or they will walk all over you”. Rodney, president of the National Pensioners Convention and ex UNISON general secretary, rounded on the hypocrisy of the ‘millionaire’ cabinet. “They rightly stand and show respect for dead at the Cenotaph for one day. But they go on to show disrespect for the living for 365 days”, he said. We rightly mourn the death of thousands in the World Trade centre “but when 25,000 old people die every year from winter related illness, nobody sheds a single tear”. The hypocrisy that says we have to pay the price when it was “they and their city friends who caused all this mess in the fist place”. “Uncaring? They’re the ones closing the hospitals, throwing people out of jobs, cut, cut cutting. He tore into the attempts to create a public-private divide on pensions. “It’s like saying that because one person has had their leg cut off, it is only fair that everyone gets a leg cut off”. “You’ll need two legs if you’re going to beat the b****** – and that’s what we’re going to do!” said Rodney as the rally erupted. “The government call us unpatriotic because 2.5 million of us are out on strike. What about the 2.5 million unemployed they’ve created – lost days every day of every year. Who is it who’s not patriotic?